This article argues that implementing successful educational reforms may require both the structure and culture of schools to be changed first, to be more conducive to implementing such reforms. In doing so, it is important to analyse the operation of power in schools, as power is a fundamental dimension in both the structure and culture of organisations. Morgan (as cited in Kezar, 2011) noted that power dynamics are deeply rooted in the routine institutional structure and aspects of culture. Power can be defined as the ability to influence the actions of others (Carlopio, Andrewartha & Armstrong, 2005) and according to Kabanoff (as cited in Carlopio et al., 2005) it can be used to "create stability but also be used for disruption" (p. 351). Thus, an opportunity exists through altering the structure and culture of schools to affect the operation of power to be more constructive to achieving successful educational reforms. 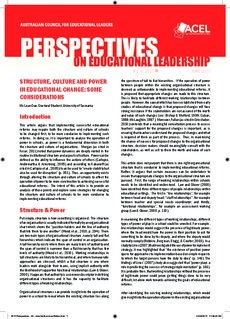 The intent of this article is to provide an analysis of these points and explore some strategies for changing the structure and culture of schools to be more conducive to implementing educational reforms.